For those who want to do something important, want to excel in the world of business, want to leave a lasting impression on your family, your community, your workplace. A lot has been written about self-motivation and even more about to motivate employees. Since we have named October Motivation Month at Industrial Solutions, I will be sharing throughout the month on what motivates people according to the DiSC profile workplace priorities. The theories behind DiSC have been around since 1928 when first published in the book, Emotions of Normal People by William Moulton Marston. He defined four primary emotions which today are categorized as Dominance, Influence, Steadiness and Conscientiousness. 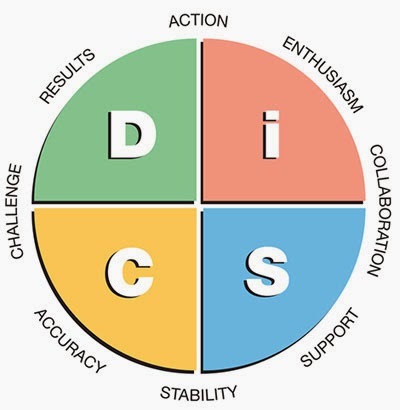 For those of you looking for more, there is a terrific whitepaper on the reliability and validity of the DiSC Profile Assessment which you can download and read. Today I want to talk about the priorities which tend to drive decisions and actions of those with the C or Conscientiousness personality type. When we are able to appeal to the priority areas of those who fall into the C quandrant on the map, we are going to be able to help motivate these employees. As you can see on the image, people in the C quandrant tend to priotize Challenge, Accuracy and Stability, particularly when they are in the workplace. These people are going to often be demotivated when the organization or team they are working on emphasizes Action or Enthusiasm over Accuracy and Stability. They are going to become quite demotivated when they feel that the organization is moving ahead or pursuing plans before a thorough assessment has been completed. They are likely to push back hard against this activity, but if they don't get any detailed response, they can tend to shut down. In addition, while they may recognize the value of collaboration and support, they can become frustrated working in teams where the emphasis is more often on relationship or individual care and not on completing tasks. To help your C co-workers, teammates or employees, first be sure that you acknowledge their need for detail and accuracy. Take their concerns about the speed of change to heart and try to give them the needed time to get comfortable with the ideas being considered. If you can spend time early-on with them discussing changes, and allow them the opportunity to ask questions, challenge ideas and get the information they need, they will be much more prepared to discuss the ideas in a follow-up or group meeting. Organizations need C people. They make sure the organization or team doesn't 'run too far ahead' or 'go off the rails'. These employees will love being asked to help identify the risks, generate a list of required action steps, and dialogue in an environment where their questions are answered logically and with detail. The best thing you can do for your C employees and co-workers is the invite their questions and engage them on issues of concern. They will make your organization better and help you take well-informed and thoroughly reviewed decisions. If you want to learn more about how more about Building Great Teams @Work, then you will want to attend one of our Fall Workshops on this topic. Contact me via email at jvonthaden@solutions-industrial.com with questions or for a 20% discount promo code. Was this helpful? Leave a comment to let me know. Also, let me know what you do to motivate your employees, particularly those highly Conscientious ones. Stillborn - No one feels the loss as she does…honestly, most don’t feel it at all. © John Von Thaden, 2011-2014. Powered by Blogger.